The International Residential Code has numerous code requirements for bathroom design. Section R307 provides spatial requirements, including minimum fixture clearances and wall materials for bathtubs and shower spaces. Other code requirements related to plumbing, mechanical, and electrical issues in a bathroom space are in other sections of the code. Typical bathroom accessories include a medicine cabinet, mirror, soap dish, toilet paper holder, towel bar, and linen storage space. A general guideline is to allow between 24 and 36 in. of towel bar space for each family member using the bathroom. Bathtubs are available in many shapes, sizes, and styles, including rectangular, corner, and oval. Three types of installation are common: recessed, drop‐in, and freestanding. Materials for bathtub surrounds include ceramic tile, solid surfacing, molded fiberglass, and acrylic one‐piece units. The surround material is important for coordination purposes during installation. Bathtubs are available in several different materials , though the fiberglass and acrylic units are the most common. Showers can be included with bathtubs or be separate fixtures. A bathtub-and-shower combination usually shares a water supply valve. The shower surround may be part of the bathtub or site built. Shower enclosures are generally three sided, with an impervious finish. A shower door or curtain completes the enclosure. These enclosures, also known as “shower stalls,” consist of a floor receptor topped by water‐resistant walls. Receptors may be manufactured or site built and are designed to slope to the drain. The enclosure walls may be either self‐supporting or attached to the house framing. 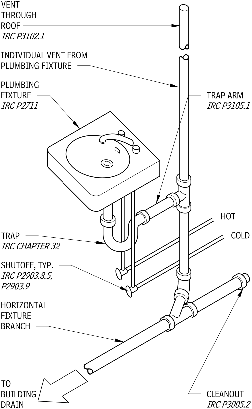 A plumbing fixture is a device or appliance designed to supply water or to receive waterborne waste, and may discharge into a sanitary waste system. Ideal fixture materials should be nonabsorbent, nonporous, nonoxidizing, smooth, and easy to clean. Plumbing codes usually mandate the number and type of fixtures that must be provided for specific occupancy, based on the capacity. Provisions for people with disabilities have been made an integral part of code requirements, which mandate the quantity and design of spaces utilizing plumbing fixtures. Plumbing fixtures include faucets and sinks, and water closets (toilets) and bidets. Medicine cabinets can be specified with either left‐ or right‐hand door swings, and are typically available in both surface-mounted or recessed styles. Side-access medicine cabinets eliminates the need to reach over a counter. Mirrors located above lavatories, sinks, and vanities must be mounted with the bottom edge of the reflecting surface 40 in. maximum above the floor. Other mirrors must be mounted with the bottom edge of the reflecting surface 35 in. maximum above the floor. Tilting mirrors that extend 4 in. from the wall at the top and 1 in. at the bottom are available in widths of 16, 18, and 24 in. and heights of 30 and 36 in. A full‐length mirror can accommodate most people, including children and wheelchair users. Americans with Disabilities Act (ADA)/Architectural Barriers Act Accessibility Guidelines 2004 recommend that the top edge of mirrors should be 74 in. minimum from the floor to accommodate both ambulatory people and wheelchair users. The Guidelines require mirrors above lavatories or countertops to be installed with the bottom edge of the reflecting surface 40 in. maximum above the finished floor . 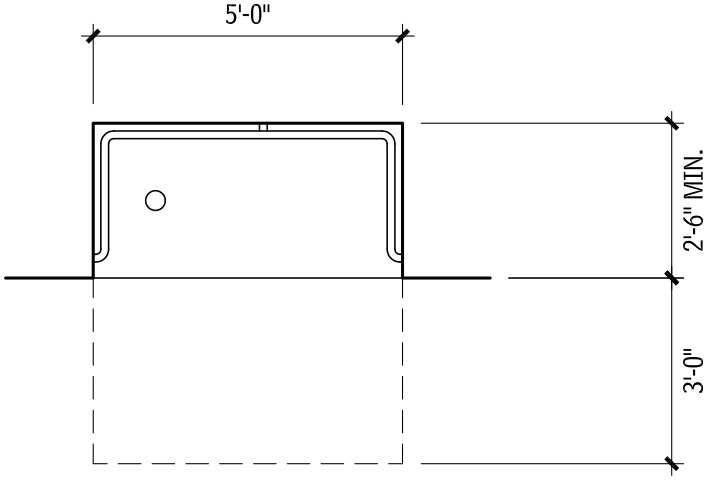 Those not above lavatories or countertops are to be installed with the bottom edge 35 in. above the floor. 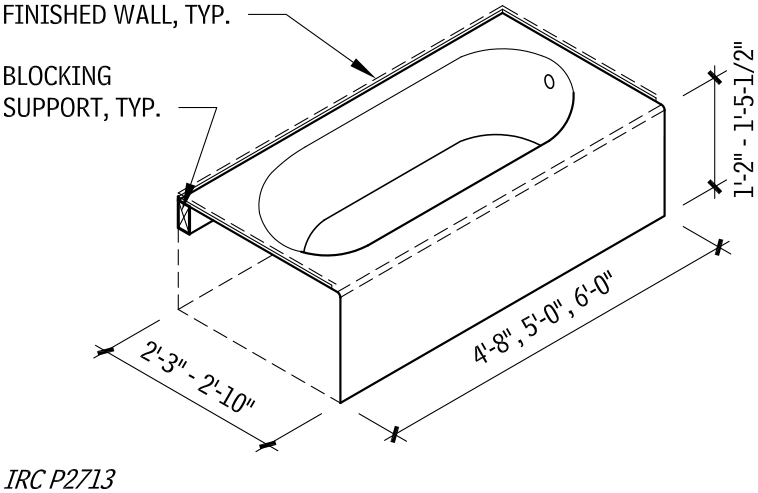 Soap dishes are available both in recessed and surface‐mounted styles, including heavy‐duty and vandal‐resistant versions. For commercial purposes, touch‐free automatic soap dispensers detect the user’s hands and dispense a small amount of soap, but these are generally not used in residential bathrooms. Accessible soap dispensers over lavatories or countertops should be mounted no more than 42 in. above the finish floor. Pushbuttons may be mounted up to 48 in. high, depending on the depth of any obstruction to wheelchair use. In addition to clearance requirements, the United States Access Board, ICC/ANSI A117.1, and the ADA include provisions for the location and operation of flush controls and toilet paper dispensers. Manually operated flush controls must be located on the open side of the toilet; they may not be centered above the toilet. The hatched area in Figure “WATER CLOSETS” indicates the allowable location of the toilet paper dispenser. Dispenser outlets must be within the range shown. Dispensers should allow continuous paper flow, not control delivery. Residential bathrooms typically include two towel bar locations, one near the sink and another near the tub and/or shower. A general guideline is to allow between 24 and 36 in. of towel bar space for each family member using the bathroom. The options for residential bathroom storage, as with most storage spaces in a house, offer some amount of flexibility and an opportunity for creativity. Stainless steel shelves are available up to 28 ft. long, and are delivered and installed in multiple sections. Full‐extension drawer glides and pullout drawer storage below the counter allow for more accessible storage. Lever handles are more easily operated no matter the users’ age or ability. Architects are very graphically oriented professionals and need quick access to potential layouts with all the necessary components that will adapt to a variety of overall floor plans. For more than 85 years, Architectural Graphic Standards (AGS) has sought to provide architects with graphic illustrations of the most current design practices and standards. 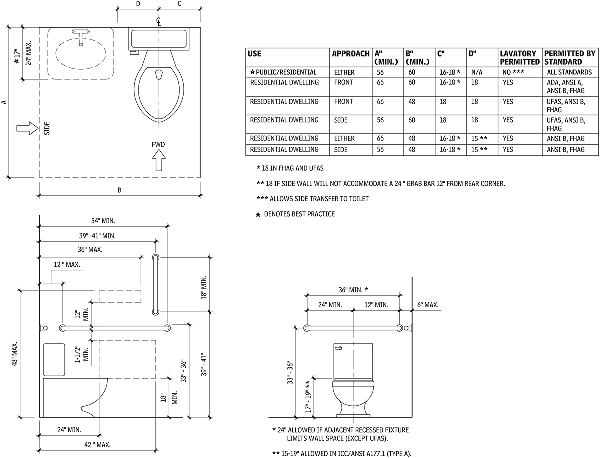 Now, AGS Online provides these graphic illustrations for Bathrooms and Layouts in a downloadable format.